Vancouver's University of British Columbia (UBC) is the most prestigious university in western Canada. It’s one of the top three universities in the country and one of the top 30 universities in the world. Located 20 minutes southeast of downtown Vancouver, UBC is home to several museums, including the UBC Museum of Anthropology, as well as top attractions like the UBC Botanical Garden and the Chan Centre for Performing Arts. One of Vancouver's top museums as well as one of Vancouver's most unique and unusual attractions, UBC's Museum of Anthropology (MOA) is world-renowned for its collections of First Nations and Coast Salish peoples' arts, sculptures, and historic works, including magnificent large-scale totems. 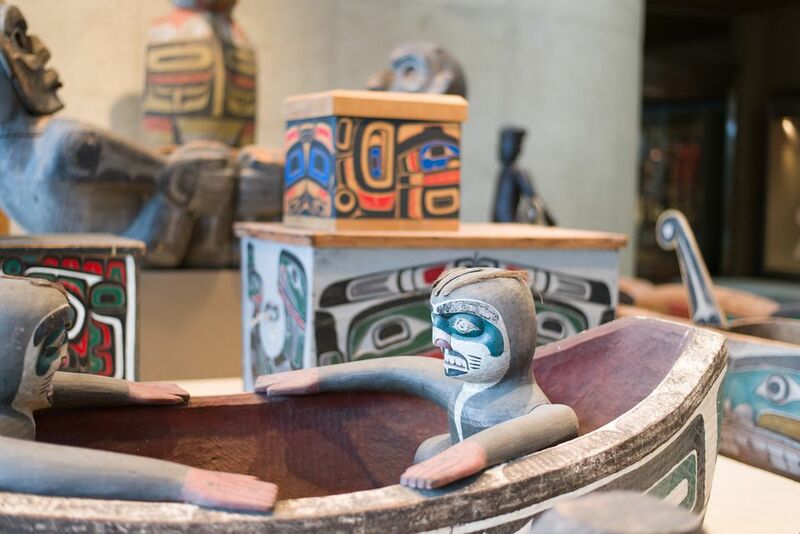 It's most famous artwork is the iconic sculpture ​Raven and The First Men by the B.C. First Nations artist Bill Reid; an image of the Raven and The First Men sculpture appears on the back of every Canadian $20 bill! The UBC Botanical Garden comprises multiple gardens, including the Asian Garden, BC Rainforest Garden and the Greenheart Canopy Walkway eco-adventure. The top attraction is the beautiful Nitobe Memorial Garden, which is considered one of the "top five" most authentic Japanese gardens outside of Japan and is one of Vancouver's top gardens. The natural history of British Columbia is on display at this hands-on museum. Home to the largest blue whale skeleton in Canada as well as two million biological specimens (including plants, marine life, insects, fungi, and fossils), the Beatty Biodiversity Museum is fun and educational for the whole family. Wreck Beach, one of Vancouver’s top beaches, isn’t on UBC's campus, but its two main entrances (pathways down to the beach from SW Marine Drive) are. Practically next door to the UBC Museum of Anthropology, Wreck Beach is a must-visit: a pristine Pacific Northwest beach with its own unique vibe: clothing-optional, hippie, isolated, magical, and a wee bit strange.